and therefore send your memos across in a more effective manner! 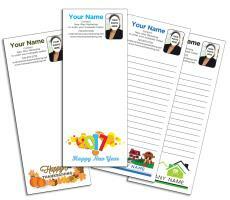 We can design any type of notepad for you! With plenty of room for your information and an imprinted message. Choose from standard messages or create your own layout! Beautiful full-color notepads are perfect for celebrating each season. • notepads are run on a standard 20#/50# white bond paper. • No bleeds on standard pads. Set-up Fee of $20.00 for first time customers (cannot be waived) (Note: Setup charge applies for any order if cancelled) *FREE Setup is for returning customers only, and that have done notepads in the last 12 months from order date. 10 to 15 Business days after appoval to print. Call for high volume notepad prices.